Home Corporate events Large Fountain Hire Extra Large Fountain Hire Mini Fountains Gallery F.A.Q. 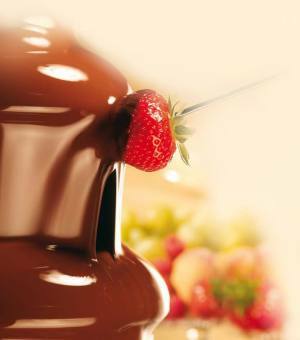 Chocolate Fountains Newcastle offers a new idea for special corporate events and any sized office party. We have small fountains to accommodate up to 50 guests per fountain or larger fountains that accommodate from 50 to 150 guests per fountain. Our chocolate fountains are not only fun for company, corporate events or small gatherings but will also provide an impact, creating a relaxed atmosphere that will enhance you business function. If you are looking for a spontaneous reward for your high performing team, Chocolate Fountains Newcastle has the perfect solution providing a fun surprise for your valued staff & colleagues. Always presented with style and imagination our chocolate fountains ensures your event looks impressive for your staff, colleagues and clients. In house or at a venue, not only will the chocolate flow smoothly it will create a great experience. Who isn't in the mood for fun at Christmas, a chocolate fountain will add a special impact to your festive season celebrations creating an atmosphere of fun, bringing your guests, celebrations and cheer together. Contact us to discuss a delicious Belgian Chocolate Fountain for your next event. DIY packages can be tailored to suit your requirements. .